Best coffee in Texas is roasted by Cuvee Coffee, in Spicewood Springs. This is the coffee that won the regional Barista championships, the coffee that Caffe Medici uses, the coffee that put Austin on the national stage for the really, really good stuff. Because I am a very lucky guy with a completely awesome wife who wins things on food blogs, I got to spend an afternoon hanging out with owner Mike McKim and his super-cool family out at the roasting facility nestled in the woods in Spicewood, TX. There were about a dozen other blog-post-winners with me, and we spent the first half hour or so peppering Mike with questions. 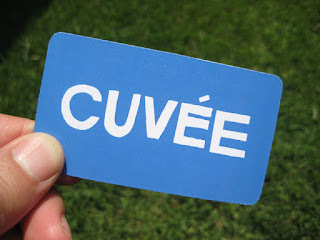 Cuvee is a small shop, but they've got global reach - Mike spends a good chunk of the year traveling to farms throughout South and Central America (Africa's on hold for the moment). We heard about cupping in Peru, hanging out on plantations in El Salvador, trying out the differences between tiny variations in the coffee tree. I made every attempt to not geek out completely. That attempt fell apart when we passed from the front office into the roasting facility, and got into the details: all the things that could go wrong with beans, the ins and outs of shipping materials, the unbelievably cool engineering that went into the high-power ribbon burners Mike and his dad developed for their old-school French roasters. Geek heaven, if you want to know the truth. 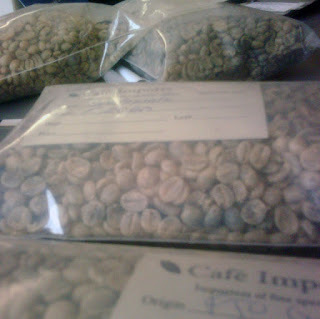 We followed the process from the big burlap bags, through the roasting, cooling, blending and bagging; we dwelt on chemistry and physics and the magic that happens at various points in the cycle. Billed at a 30 minute tour, we were now a good hour and a half in. Turn out foodies have a lot of questions. 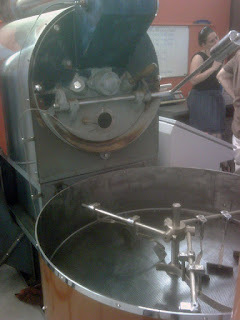 From the roasting floor we went into tasting - four coffees, washed Peru, Gutamala, El Salvador, and a natural Brazil. The washed coffees are where the coffee cherry is removed, leaving the just the bean to dry; and natural, where the whole coffee cherry is left intact to dry around the bean and later removed. Tasted next to each other, which I've never done before, the differences were amazing - from the complex citrus zing of the Peru to the long slow mellow rumble of the Brazil. We steamed milk on a tricked-out La Marzocco Linea (swoon), drank single origin Brazillian espresso (gasp), and generally overstayed our welcome. Side note: there's about a month's supply of the Peru Chachunda left, and it's totally life changing. Sometime later in the afternoon, in a hazy happy caffeine buzz, I left Cuvee and drove home. Thank you Tasty Touring. Thank you Mike. And Thank you Tracy. That. Was. Awesome. Nice! And small world - Jodi Bart, who writes Tasty Touring, is a friend and colleague. I haven't tried their coffee, but I'll check it out. I've been meaning to ask you if you've stopped by La Boite yet? Really good croissants, lovely macarons, good coffee, and the best sandwiches in town. Plus super nice people. 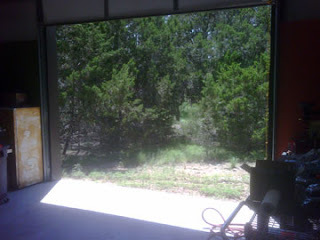 Check it out if you haven't been there yet and let me know what you think. Jodi was a blast - the whole thing, really. Could not have asked for a better afternoon. Easiest way to get the goods is to swing by Caffe Medici at West Lynn and 10th. They also sell it at Whole Foods, but last time I went by, the stuff they had in stock was pretty old. Medici definitely the way to go. Excellent write up of an excellent afternoon. It's always fun to be in the company of fellow coffee geeks. I have to second two things you said: That Brazilian espresso was incredible! I think we will be battling it out to acquire the Peruvian anywhere we can. :) Thanks Jenner! And now I get to try some cold-brewed - I've heard about *how* to do it, but I don't know that I've heard so directly how it actually tasted until you gave the run down. What a fun day!!! Mike is definitely the Coffee Guru! It must have smelled amazing out there! Great to meet you, Eli. You impressed us with your coffee acumen! So glad you could be there to truly enjoy it.